"This is a HUGE hit at all of my parties!!! With kids, as well as adults...and it is very easy to make!!! 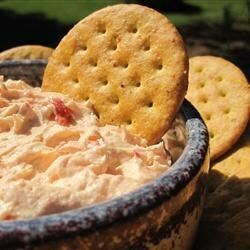 Serve this flavorful dip with tortilla chips. Roasted red peppers and two kinds of cheese create the perfect combination. Adjust the amounts of onion and garlic to taste." In a small baking dish, mix the roasted red peppers, Monterey Jack cheese, cream cheese, mayonnaise, onion, garlic and Dijon-style mustard. Bake in the preheated oven 20 minutes, or until bubbly and lightly browned. Serve warm. Everyone loved this dip - especially the teenagers! The only changes I would make would be to use a little less mayo and more cheese. The color was perfect for the Christmas buffet. Two words: DE-LISH!!! I used lite mayo and 1/3 less fat cream cheese and it was still super creamy. One note: don't rewarm in microwave, it will seperate. LOVE THIS DIP!! !